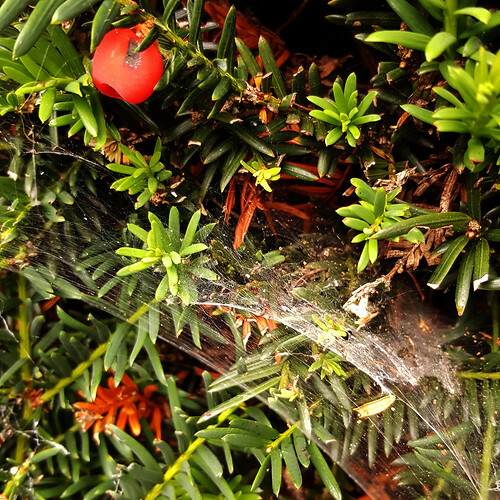 Yew (taxus baccata) is a very poisonous tree, appearing in both English legend and folklore. Source of the wood for our famous longbows, it also stands guard over churchyards and sacred sites. But is its deathly reputation entirely deserved? Or has it earned its place in our national folklore? The toxicity of the trees means they rarely appear in folk remedies or herbal medicine. That said, craftsmen used its wood to make longbows in medieval England. Its slow growth makes its wood tight-grained and tough. Its value to archers lies in its combination of heartwood and sapwood. The heartwood withstands compression, and easily returns to its original shape. The sapwood withstands tenson, and protects the heartwood from breakages. According to Paul Kendall, the Fortingall yew in Glen Lyon, Scotland, is believed to be anywhere between 2000 to 9000 years old. In one legend, Pontius Pilate was either born under the tree, or played in its branches as a child. While the Romans didn’t fully invade the UK until 43AD, groups of Romans had visited the islands from 55BC. Perhaps Pilate’s father simply heard the news of his son’s birth while visiting Fortingall. Its toxic reputation precedes it. Shakespeare mentions yew in Macbeth; the murderous king makes a deadly potion including “slips of yew, silvered in the moon’s eclipse”. Yews are probably the most common trees found in old churchyards around Britain. Glennie Kindred observes that a lot of the churchyard yews were probably there before the churches were built, making them an earlier gathering place for small communities. The Fortingall yew predates Christianity itself. Yet Mara Freeman notes another link between the tree and Christianity. The yews in Dyfed, Wales, allegedly bleed a red substance every year in sympathy with Christ, while branches of yew stood in for palm leaves on Palm Sunday. 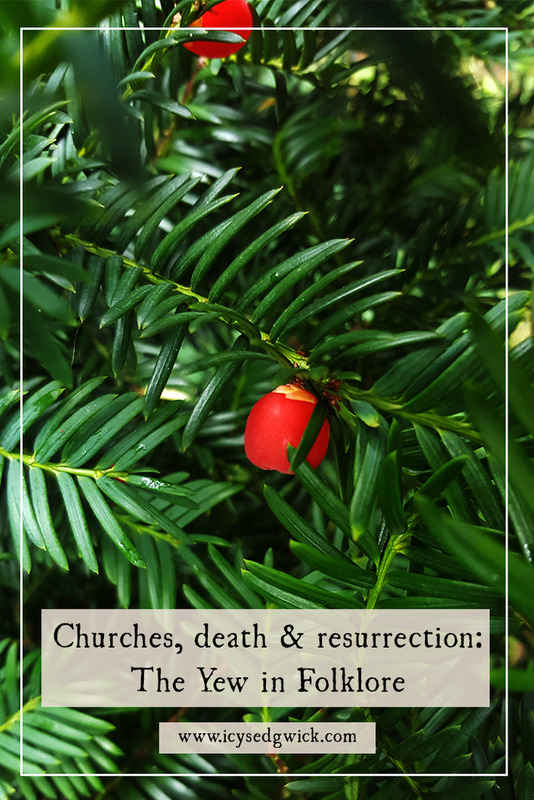 In some parishes, villagers would see in the New Year by gathering under the branches of the churchyard yew. Amy Stewart explains that Roman invaders offered church services beneath yew trees to appeal to the pagan population. When the churches were built, they took over from the trees as a gathering point for the congregation (2010, 221). Fred Gillam asserts that churchyard yews were actually planted to provide a wood source for longbows (2008, 44). However, Margaret Baker disagrees since one tree only provided enough wood for five bows, and many trees still survive in churchyards. The Druids held the yew as a sacred tree, which symbolised death and resurrection in their culture. Its poisonous nature no doubt contributed to these connections. It was often planted in graveyard because the roots were believed to grow through the eyes of the dead to hold them in place. By the 19th century, the trees had become a symbol of death. If someone brought yew into the house among the Christmas decorations, those in Suffolk believed it heralded a death in the family before the year ended. But in Derbyshire, people wove yew intentionally among the evergreen decorations, used specifically around the window. Yet the tree grows in an unusual fashion. Its branches grow downwards, and when they reach the ground they form new stems. These branches grow into separate, but linked, trunks. Unsurprisingly, this regenerative nature of the tree links it with resurrection, and the tree often symbolises the cycle of life. The tree is sacred to Hecate, one of the guardians of the Underworld. In the fens, locals believed people should avoid the trees as they sheltered witches. Yet in Brittany, the tree held the corpses in place in churchyards by spreading a new root into each mouth. At Ystradgynlais, Wales, groundsmen keep the yews pruned because of a local legend. 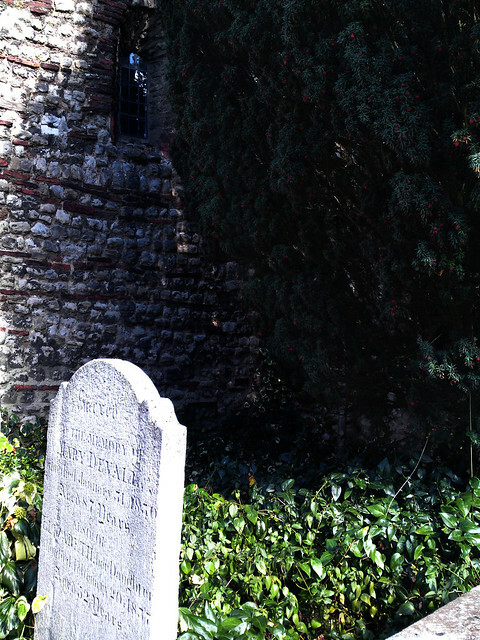 It states the world will end when the smallest yew in the churchyard grows as high as the belfry (Baker, 2011, 163). Baker notes that yew is one of Ireland’s Five Magical Trees, and easily rivals oak, elder, rowan and hawthorn (2011, 162). The yew doesn’t just herald doom and gloom. The trees protect houses, so it’s bad luck to cut one down. In Spain, people hung the branches from balconies to protect against lightning. They guarded against fire in the Hebrides when mingled with roof thatch (Baker, 2011, 163). In other parts of the century, people gathered yew branches Easter and hung them in the kitchen to prevent heavy bread. People used the branches in dowsing. Glennie Kindred also notes a peculiar belief in northern Scotland; apparently if a person held a branch in their left hand, they could speak to anyone without that person being able to hear, although anyone else present could. The trees are magical and ancient guardians in the British landscape. If you maintain healthy caution of their toxicity, they’re fascinating trees to investigate! Enjoyed this post? 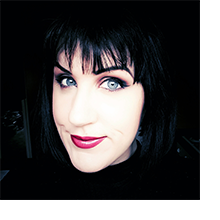 Sign up below and I’ll email you every time a new article goes live! Baker, M. (2011) Discovering the Folklore of Plants, 3rd ed. Oxford: Shire Classics. Freeman, Mara (no date) ‘Tree Lore: Yew’, Druidry, http://www.druidry.org/library/trees/tree-lore-yew. Gillam, F. (2008) Poisonous Plants in Great Britain, Glastonbury: Wooden Books. Kendall, Paul (2015) ‘Yew’, Trees for Life, http://treesforlife.org.uk/forest/mythology-folklore/yew/. Kindred, Glennie (1997) The Yew: Sacred Tree of Transformation and Rebirth, The White Dragon, http://www.whitedragon.org.uk/articles/yew.htm. Stewart, A. (2010) Wicked Plants: The Weed That Killed Lincoln’s Mother & Other Botanical Atrocities, Portland, OR: Timber Press. I only knew about the tree’s use in bows. Fascinating stuff. I did not know the yew tree had so much folklore associated with it I love the part about the roots and the eyes of dead people. Such a fascinating read. Love your blog, Icy. Keep up the good work! Only five bows per tree? Each bow would be, I’d guess, less than two metres long and a width that can be easily grasped in one hand. And we produced thousands of the things. This doesn’t seem to add up. Do you have any more information to support it? Not really. I just report on what I find.